Fund My Mutual Fund: Las Vegas Sands (LVS) - Too Big to Fail? Las Vegas Sands (LVS) - Too Big to Fail? I was a long term bear on US casinos in 2007, more on the fact that I thought Las Vegas exemplified all the things of American consumerism that were going to change - namely excess. [Oct 3, 2007: A Top in Casino Names? Wynn and Las Vegas Sands] [Nov 1, 2007: China Can't Save Las Vegas Sands - It's Getting Crox'd] I was not quite as up to speed on the extreme debt exposure of MGM Grand (MGM) and Las Vegas Sands (LVS) in particular, which served to threaten bankruptcy at a point. [Oct 28, 2008: Las Vegas Sands is now a $4 Stock] At their worst these stocks fell some 98%+ from peak to trough but it is becoming clear that these two have become "too big to fail"... with Las Vegas Sands ahead of pace of MGM Grand in fixing its situation. I was under the mistaken assumption that banks would come collect their collateral but with zero major homebuilder bankruptcies, only 1 major public commercial REIT, and zero Las Vegas casinos it seems leniency is the new way of the US world. So while I still think Las Vegas as a tourist attraction, will take much time to get back to "normal" and the casinos are effectively handing away rooms (I literally saw a deal from Burbank, CA to Wynn Resort ON PRIVATE JET including HOTEL for just over $500), survival no longer seems to be as much of an issue. [Dec 23, 2008: Wynn Encore Casino Struggling to Fill Rooms During Launch] If in the greatest collapse of housing and commercial real estate almost none of our public companies in those sectors go bankrupt it appears "creative destruction" is something from a bygone era. In this space specifically we've noted some amendments of credit terms [Apr 22, 2009: Wynn Resorts, Las Vegas Sands Amend Credit Terms] and it continues almost monthly. Yesterday, LVS announced an issuement of bonds which, while dilutive to current shareholders, continues to "push off any date of reckoning" on their balance sheet. Las Vegas Sands Corp (LVS), one of the world's largest casino companies, has secured commitments to raise up to $600 million through the sale of exchangeable bonds, the company said on Wednesday. The bonds will have to be swapped for common shares of the company's Macau unit after the unit's pending initial public offering on the Hong Kong Stock Exchange. The sale is part of highly leveraged Las Vegas Sands' efforts to boost its financial strength, the company said. It recently amended its $3.3 billion Macau credit facility and plans to take one of its subsidiaries public. The financing will prevent looming U.S. debt covenant breaks in the third and fourth quarter, Bernstein Research analyst Janet Brashear said in a research note. "Without this stop-gap measure, we had projected that LVS would have approximately $100 million too much debt at September 30 and approximately $400 million too much debt at December 31," she wrote. "Completion of the Hong Kong IPO is the last hurdle, but today's development is material as it probably further reduces near-term covenant risk," Bank of America analyst Shaun Kelley said in a research note. 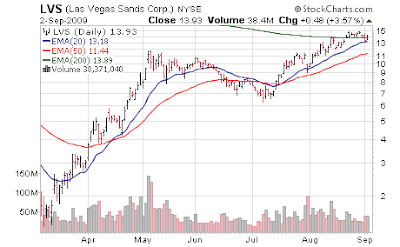 I expect continued volatility in the space, but Las Vegas Sands (LVS) is looking more interesting for the long term. However, after such a run - I'd like to revisit it when (if) the stock market pulls back and we see a single digit price level again. Putting a valuation on this name is difficult - all I know is it is now appears in America, failure is almost never an option. Just don't call us Japan.